Heartburn, also referred to as indigestion or acid reflux, is just one of the many digestive issues that have become increasingly common. It is a painful burning sensation in the chest or abdomen caused by stomach acid burning the sensitive tissue of the esophagus. Of course, Big Pharma has an answer for this discomfort and like many of their other answers, the risks outweigh the benefits. All of the over-the-counter (OTC) heartburn medications on the market work by reducing or weakening the acid in our stomach. This is like turning off your fire alarm because the sound hurts your ears rather than putting out the fire! Stomach acid serves many important functions for both digestion and immunity and both suffer when it is suppressed. The protein-digesting enzyme pepsin needs a very acidic environment to work. Stomach acid provides this as it typically has a pH of 1.3 to 1.5. This level of acidity also serves to destroy many of the harmful bacteria in and on our food. The chronic use of OTC heartburn medications has been linked to several serious outcomes. When we lay down to sleep, it is common for small amounts of the fluid in the stomach to travel up the esophagus to the junction where the wind pipe and esophagus meet. Some of this fluid can then get into the lungs. This is a normal occurrence, even in healthy people. It can cause pneumonia in those with weakened stomach acid because the fluid found in the stomach is typically acidic enough to kill any pathogenic bacteria that may be carried in with our food. If that acid is weakened, these bacteria are free to multiply and then can be transported to the lungs, potentially causing an infection. The bacteria Clostridium difficile (C. diff.) causes severe, potentially deadly diarrhea. The most common way that people are infected with this bacteria is by swallowing it. Normally, stomach acid destroys C. diff. before it can colonize and infect you. Long-term use of OTC heartburn medication has been linked to a greater risk of C. diff. because more of the bacteria survives the trip through the stomach and into the intestine. Stomach acid also allows proper absorption of calcium because an acidic environment is required to break calcium down enough for absorption. If the acid in the stomach is not strong enough, it could lead to an inability to fully absorb calcium and, over time, weaker bones. In fact, researchers have found a link between long-term use of OTC heartburn medication and hip fractures. In order for the body to use vitamin B12, it must first be separated from the protein that it is typically bound to in food. What separates it? You guessed it. Stomach acid! It is well known that the use of heartburn medication puts one at risk for B12 deficiency. It is now common practice for physicians to monitor B12 levels of patients using this class of medications. That burning, painful sensation that you are experiencing after eating could well be a sign that you are having a negative reaction to gluten. 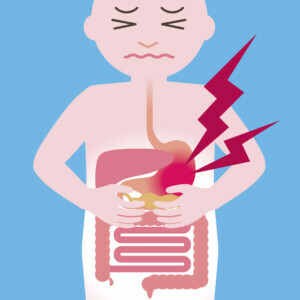 Studies have shown that heartburn/acid reflux/indigestion and GERD are strongly associated with gluten sensitivity. Gluten causes inflammation in the gut but is also associated with inflammation and damage in other parts of the body. When the esophagus becomes inflamed, it is more sensitive to damage from stomach acid. By protecting yourself from gluten, you can stop the inflammation, stop the damage and stop the pain. GlutenShield® works to break down gluten, dairy and other problem ingredients in processed food that can cause inflammation. It also helps to support the immune system and allow the gut to heal. 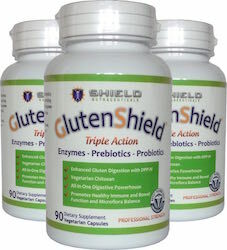 The proprietary blend of enzymes, prebiotics and probiotics in GlutenShield® work synergistically to protect your gut and promote optimal digestion in a safe and natural way.